Ambassadors steal the show, “Jared Diamond Speaks to the Young on Environmental Challenges” the APRIL 4, 2014 episode of NPR’s On Point with Tom Ashbrook. Audio clips of Ambassadors Zoe and Isaac figure prominently in the discussion. The lively broadcast explores how humans, and in particular young people growing up with a dangerous changing climate, might respond to our greatest challenge. History professor and bestselling author Diamond begins this interview, “the current generation is the first generation that faces the risk of the whole world being messed up.” As a parent, the author had to answer to his own children when their school assigned one of his books for class. He says historically young people have regularly faced overwhelming threats to civilization; but children now grow up worrying about the end of all civilizations. After playing clips from Ambassadors’ speeches, Jared Diamond suggests that young people who understand what is happening to their future can have a powerful influence on how families respond. The Ambassador audio clips come from Zoe’s speech before the Governor’s Climate Legislative Executive Workgroup in Seattle and Isaac’s speech to the Power Past Coal Rally in downtown Portland. Be forewarned: after hearing Jared Diamond, you might have to break down and buy the book. It sounds perfect for families who face this crisis together. Although you’ll find no simple answers and only a 50-50 wager on how humans will turn out, Diamond sounds genuinely hopeful for a History professor who has devoted his life to studying the end. Zoe and Wren speak to the Gov’s hearing. CLICK BELOW to watch! Thanks a billion Zoe and Wren! Stay tuned when they finish to hear from a surprised grownup! Two 7th graders from Seattle announced the Washington Billion Tree Campaign as part of Plant-For-The-Planet’s global reforestation effort. With clear moral authority the 2 ambassadors set the new goal of 6% emission cuts to hold earth to 1-degree warming for this generation. Is the Workgroup listening? 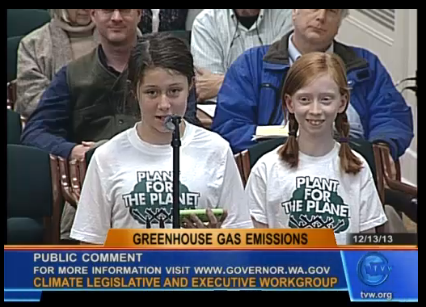 Wren had the important task of announcing Washington’s Billion Tree Campaign to the Governor at the hearing. Her energy and enthusiasm certainly made tree-planting sound like fun. When Wren concluded, “So who’s ready to plant some trees?” the entire room erupted in applause and cheers! “Climate scientists may have reached a consensus about the danger of human contributions to climate change, but getting a political consensus for how to respond will take some time at the Washington state Capitol. Friday’s third and final hearing before Gov. 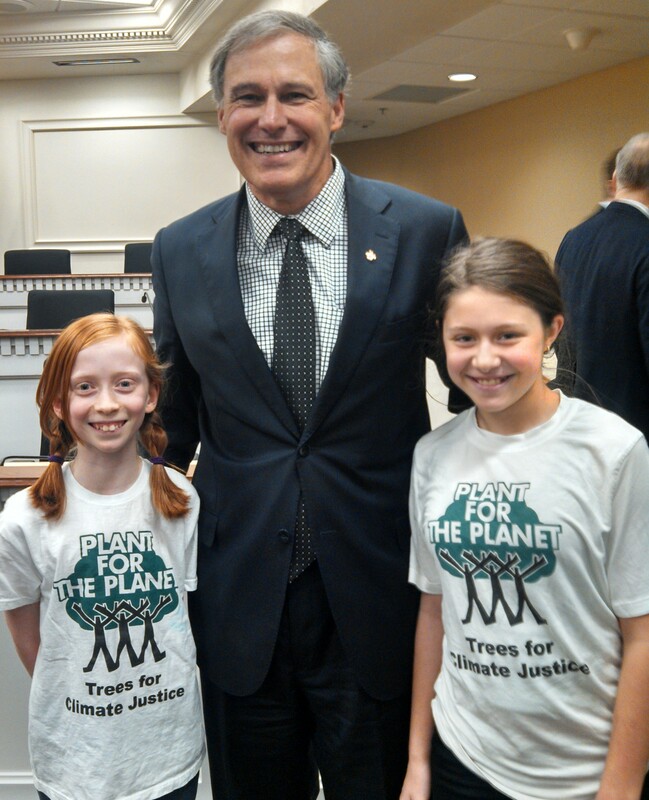 Jay Inslee’s climate workgroup elicited an array of messages from the environmental movement, business groups, the oil industries and a slew of individuals — including two school kids from Seattle who are part of a project planting trees and said they can’t afford to wait for action. More news and links from Olympia soon! Check back for ambassador activity every week. Or better yet, click to “Follow” us here on climatechangeforfamilies, so you’ll get a notice when we post news! I first wrote about Plant for the Planet back on September 10, 2013. Since then things have been happening very quickly. On May 24th 2013 in Seattle the first academy on the west coast trained 80 young students from 13 schools . 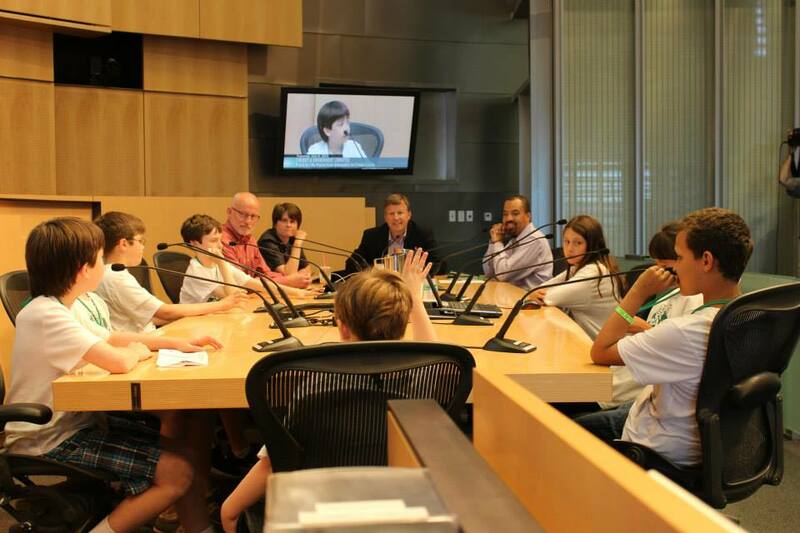 On Saturday, October 26, 2013 two more academies were organized for students from 26 Seattle area schools. I volunteered at one of them and it was an uplifting and enlightening experience. Students 8 to 14 years old standing up in front of other students of the same age speaking with knowledge, clarity, passion and confidence about climate change. Speaking with knowledge and confidence. Kids showing other kids pictures of young people their age in other countries shaking hands with world leaders, pop stars, and famous actors and actresses. Young people showing pictures of themselves speaking in front of city councils, mayors and crowds numbering in the thousands. I spoke to an eleven year old girl waiting in line to take the stage to present her portion of the presentation. She looked me in the eye and said, “I’m a born leader.” She then took the stage and confidently delivered her message to the crowd. A parent volunteer who told me she at first was not excited about being involved but her daughter’s enthusiasm had convinced her to get involved. She was so thankful. Young people in the crowd boldly questioning and offering solutions to Washington State Representative Jamie Pedersen who dropped by to show his support and share ideas. Washington St. Rep., 43rd District fielding questions. The day brought back fond memories of when I was a Middle School teacher.As a former Middle School teacher, with ten years experience teaching 5th, 6th and 7th grade, this academy reminded me of an elective I was allowed to develop and teach at Ruamrudee International School in Bangkok, Thailand called Teacher’s Aide. The elective introduced students to the field of teaching, gave them their own students to teach and the responsibility to design lesson plans, develop and administer tests, and give their students a grade entered into their official school record. All this was under the guidance of me as their elective teacher. It was extremely successful and both I and the administration were amazed at how mature, dedicated and effective the student teachers were with their own students. In these Academies, much of the same is going on. Children who have already been trained in previous Academies, give speeches to a new group of children to teach them about the climate crisis and train them as “Ambassadors for Climate Justice”. Through group work and presentations the children are taught about climate justice and they also learn how to present these ideas to others in a confident and exciting way. I want every kid in the USA to have a chance to experience an Academy, to learn to speak out for the future they will inherit, while it’s still possible to make a huge difference. Today the children need volunteers all across the country. What does it take to host an Academy for 80 students? People. Parents, retired teachers, college students, anybody can organize a day-long workshop for local kids in every town all over the USA. Let’s get a competition going to plant more trees. Parents know we have to change our ways but we don’t want to short-change our children now, so we try not to think about it. But we’re failing our children treat them to a comfy life now, but don’t think ahead for them. In January 2007, a German boy, 9-year-old Felix Finkbeiner founded The Plant-for-the-Planet Children´s Initiative . While researching a climate project for school, Felix grew inspired by Wangari Maathai, who planted 30 million trees in Africa. In his class presentation, Felix ended by saying that he thought children could plant one million trees in each country of the world. Since then Plant-for-the-Planet has grown into a worldwide movement. By the start of 2011 there were children participating in more than 93 countries. It has trained over 19,000 children from all over the word and that number is increasing rapidly.The United States has been a late comer to this children’s movement but that is about to change. The ripples Michael Foster started are beginning to feel like waves! He’s looking for others to assume the role he’s taken on in Seattle. Engaged in the World games. 1. It involves those most affected by climate change – young people. It provides them with the knowledge and leadership skills necessary to carry the message to their peers, parents, teachers, politicians and community business leaders.2. Peers listen to other peers. It’s the power of peer pressure put to work. 3. It involves parents with their kids future and educational development. It motivates them to get involved in climate change action as a result of that involvement. It is hard to ignore your children. 4. It involves teachers always looking for creative and innovative opportunities to engage their students in order to teach them valuable skills such as leadership and public speaking. 5. It involves politicians. It is hard to ignore a young person knocking on your door or asking you a question if you are a public figure. They know if they do their parents, whom they need to vote for them, will not forget. Participants learning about properly planting a tree. 6. It involves community business leaders always looking for good PR opportunities in order to portray a caring partner image to their community of customers. 7. It attracts the press. Young people doing amazing things always attracts the cameras. 8. And finally, and most importantly, it gives all involved a tangible, realistic way to get involved and move forward with a feeling of hope and empowerment. To begin the process of organizing your own Academy the best place to start is at the Plant for the Planet website. Here are some key places to visit. 1. Suggested flyer and schedule for Academy (template). 2. Pictures to choose from for slideshow presentation (power point) (takes some time to load but worth the wait). These pictures are used as visual aides to assist students oral presentations. 3. Ideas and detailed information on how to get the ball rolling in your community. This is a YES WE CAN program bubbling with the optimism that only youth can bring to the table. We need that energy in the environmental movement. It’s time to Stop Talking and Start Planting. It’s time we join and assist in any way we can these young Ambassadors for Climate Justice. Michael Foster: A mental health therapist and father in Seattle. Mike always had an interest in the impacts humans have on the health and welfare of our planet. From his childhood in Texas, where he grew up in the shadow of oil refineries, he has always been aware that we have the ability and the obligation to be positive stewards for the Earth – not just for ourselves, but for future generations. Mike is a speaker for the Climate Reality project, the Al Gore initiative, and volunteers his time to present “The Slide Show” to any and all interested groups. His particular focus is exploring the ways that families can work together to reverse global warming and create a sustainable future. Michael Foster is ready to help anybody interested in organizing and conducting their own Academy. Watch our Ambassadors introduce Seattle City Council’s Energy & Environment Committee to Plant-For-The-Planet and get down to business. In their first public appearance, 8 Ambassadors share the famous slideshow, originally developed by Felix Finkbeiner, but with special information for Seattle City Council. And then they make some big requests! They told the Committee how many trees Seattle residents need to plant by 2020 to help us buy time and absorb excess CO2 this century, (hint: it’s a lot!) and some ideas for how to get started. How did the Council respond? Well, find out in the 20-minute Q & A following the presentation!